Corneill Jean Francois Heymans was born on March 28,1892 in Ghent, Belgium. His father J. F. Heymans, was a professor and rector at the University of Ghent and founded the J. F. Heymans Institute for Pharmacology and Therapeutics at the university. Heymans attended St. Lieven's College in Ghent, St. Jozef's College in Tunhout and St. Barbara's College in Ghent. He got his medical education at the University of Ghent, graduating in 1920. After finishing his doctorate he began a tour, doing research at a number of universities including the College de France Paris, the University of Lausanne, the University of Vienna, the University College of London, and Case Western Medical School. In 1822 he returned to the University of Ghent where he took a position as Lecturer in Pharmocodynamics. 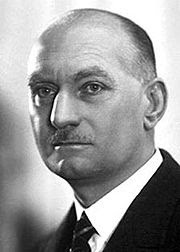 In 1930 he succeeded his father as Pharmacology and Head of the Department of Parmacology, Pharmacodynamics, and Toxicology, also becoming director of the J. F. Heymans institute. A prolific author, Heymans has published numerous papers, at first collaborating with his father. His research focused on the physiology and pharmacology of respiration, blood circulation, metabolism and pharmacological problems. Building on the anatomic studies of Fernando de Castro, Heymans determined that nerve receptors in the carotid body (glomus caroticum) respond to chemical signals. These receptors, located in the fork of the carotid artery (which runs along both sides of the neck) respond to the partial pressures of oxygen and carbon dioxide in the blood, and also pH. Signals from these receptors work in conjunction with the brain stem to regulate breathing rate. When these receptors detect high carbon dioxide and/or low pH they act to increase the breath rate of the lungs, thus moving more oxygen into the system. For his work in discovering the effects of these nerve receptors Heymans was awarded the Nobel Prize for Medicine and Physiology in 1938. From 1953 to 1963 he worked for the World Health Organization. He retired in 1963, becoming a Professor Emeritus. Heymans died on July 18, 1968.